Vintage Valentine Museum: Charles Twelvetrees - Man of Mystery! Charles Twelvetrees - Man of Mystery! 2 1/4" x 3 1/8"
The same image can be found in larger sizes with mechanical action on the squirrel - so he pops up out of the snowdrift. Rubber? No - Just looking for my valentine. You're guilty, the Judge and Jury say, But I can't be convicted on St. Valentine's Day. If you're scared of my little pal How do you expect to be my gal? Everything will be quite DUCKY, And I'll consider myself so LUCKY If you will be - My Valentine! 7 3/4" x 4 3/4"
Or you'll hear plenty BARKING! And I'll turn somersaults for you. Charles Twelvetrees is a somewhat elusive character. There is a Charles R. (or perhaps there isn't as there is some debate to whether a Charles R. actually existed) and a Charles H. Twelvetrees (1888-1948) who were alleged by some to be father and son. They may have worked together or may not have even if both did indeed exist. 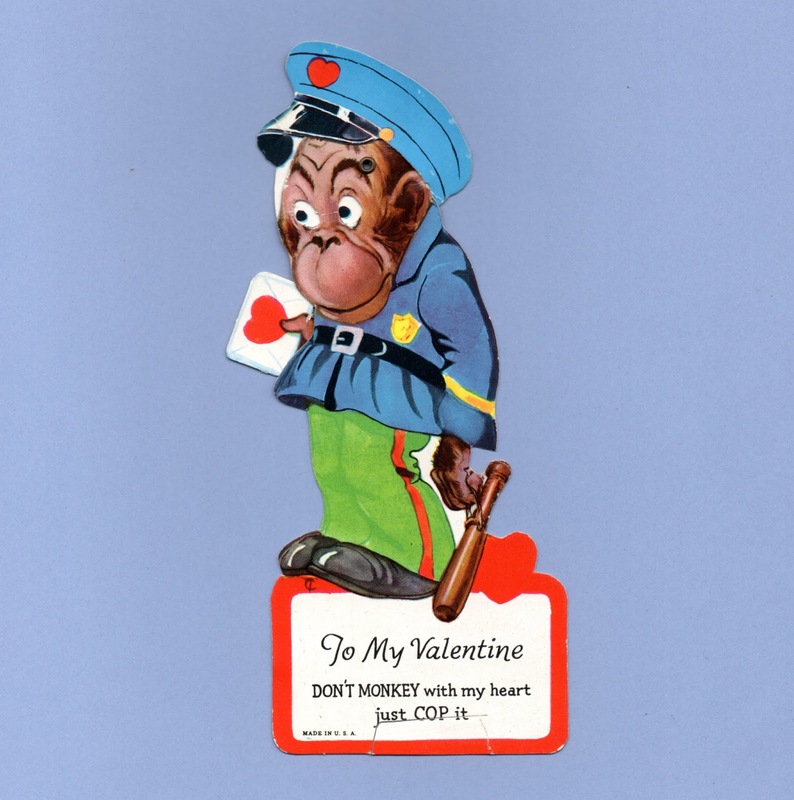 To My Valentine Don't MONKEY with my heart just COP it. There are cards signed with a CT mark, others that say C Twelvetrees, CH Twelvetrees, or just C. There are also many to be found that are unsigned. Earlier images (like the postcards) could be the work of Charles H. (who was known to be the illustrator of newspaper comics like Prince Domino and Muffles from 1910 and Johnny Quack and the Van Cluck Sisters from 1909-1911) with the magazine illustrations and later cards being the work of Charles R.
We can absolutely be certain of the existence of Charles H. Twelvetrees and many works bear a signature indicating Charles or C. H. Twelvetrees as the specific creator. I know of no cards or other artwork indicating a Charles R. Twelvetrees specifically as the artist, although I have read claims of some work by Charles H. being mistakenly credited as by Charles R. by some unspecified publisher. 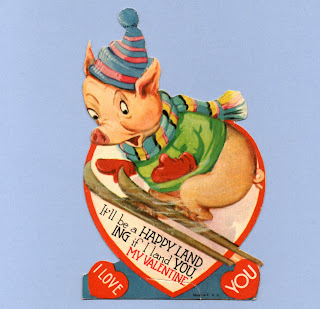 If true, this may be the origin of a non-existent Charles R.
It'll be a HAPPY LANDING if I land YOU, My Valentine. I Love You. In fact, I have become fairly certain that this Charles R. probably never existed. A Charles Henry Twelvetrees appears to have lived in Brooklyn at the time of the 1940 census. He is listed there as married, with the age given as 67 (indicating a birth of 1872/73). This fits with info giving a birth date of July 29, 1872. Quixotically, in the 1920s census a Charles H Twelvetrees is listed as 37 (birth year then about 1883). That same census lists a Henry Twelvetrees as 73 years old (birth 1847) with a spouse, Eliza at age 65 (birth year 1855). These are likely the parents of Charles H.
Say You'll Be Mine. 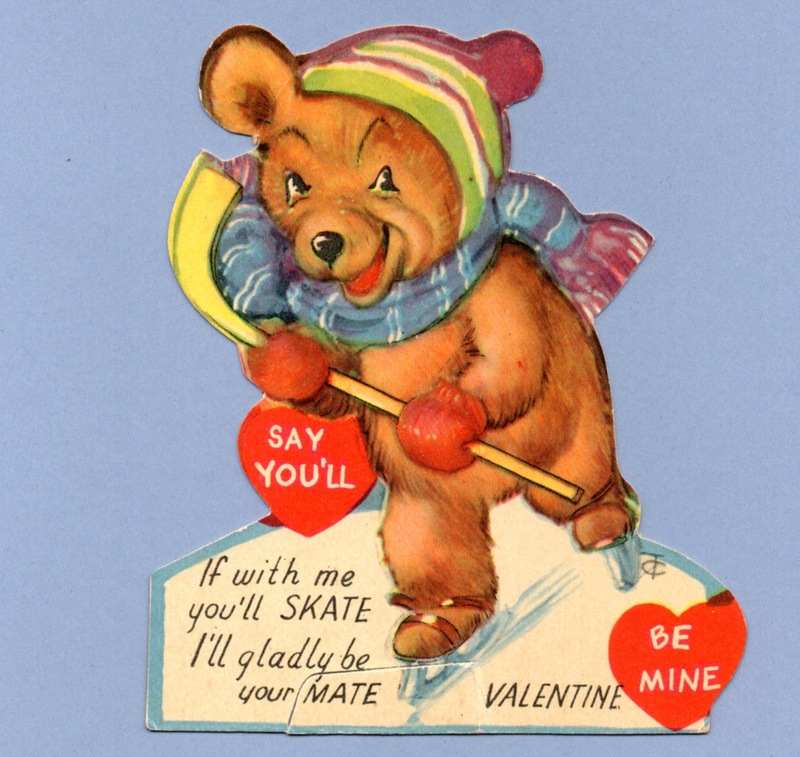 If with me you'll SKATE I'll gladly be your mate. An obituary for an Anna Twelvetrees appears in the January 4, 1903 edition of the New York Times. Her death is stated as December 26 with a residence given of 223 West 83rd St, husband listed as Charles H. It is likely that Anna and Charles were the parents of Clark Twelvetrees who was the first husband of actress Helen Twelvetrees (Helen Jurgens prior to the marriage). I have found mention of a sister, Flora Amelia, born April 20, 1874 who died July 19, 1909. I have not been able to find the records for Flora Amelia, however, just mentions on some of the genealogy sites. Rumor has it that an ebook regarding Charles H. is in the works, so hopefully some of this confusion will be cleared up soon. A letter today will make my sweetheart GAY. Whoever the man behind the name may be, Twelvetrees excelled in images of chubby cheeked children. You'll also notice his distinctive little bulldogs as a repeated theme. He did many animal images in addition to the dogs, with them appearing sometimes in costume, sometimes not. The costumes can be wonderfully detailed and include old-fashioned items like spats. 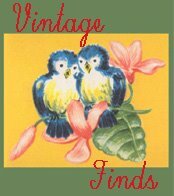 There are many apparent series to look for, making for some fun hunting for collectors! Horsman also based a series of dolls on Twelvetrees' children in the 1920s for today's determined collectors to hunt down. Cause you're my Valentine I'se gonna be DISH-gusted till yo' shines up to me. In April of 1948, Charles H. Twelvetrees died of natural causes in his bathtub in a New York City hotel where he appears to have resided. The New York Times carried an obituary that listed no survivors, so despite his great success with images of children, he may not have had any of his own. There are several reproductions of Twelvetrees valentines out there to be aware of. Some of these date to the 1980s so are old enough to be considered "vintage" in their own right and can have a bit of an "aged" look due to this. Treasure House Imports of Seattle, WA made some of these repros back in 1982. Other reproduction companies to be aware of include Shackman, Old Print Factory, Merrimack Publishing and Gallery Graphics Inc. Most of these reproduction cards are clearly on the back as by one of these companies. I do not know of any reproductions coming out of Germany, so the cards marked as made there are unlikely to be repros. Plunking on the same old tune be my Valentine. 5 1/4" x 4 1/4"
For more information see: The Antique Shoppe Newspaper, Feb 22 2008 article by Roy Nuhn; Valentines by Katherine Krieder; 100 Years of Valentines by Kathrine Krieder; Valentine Treasury by Robert Brenner. 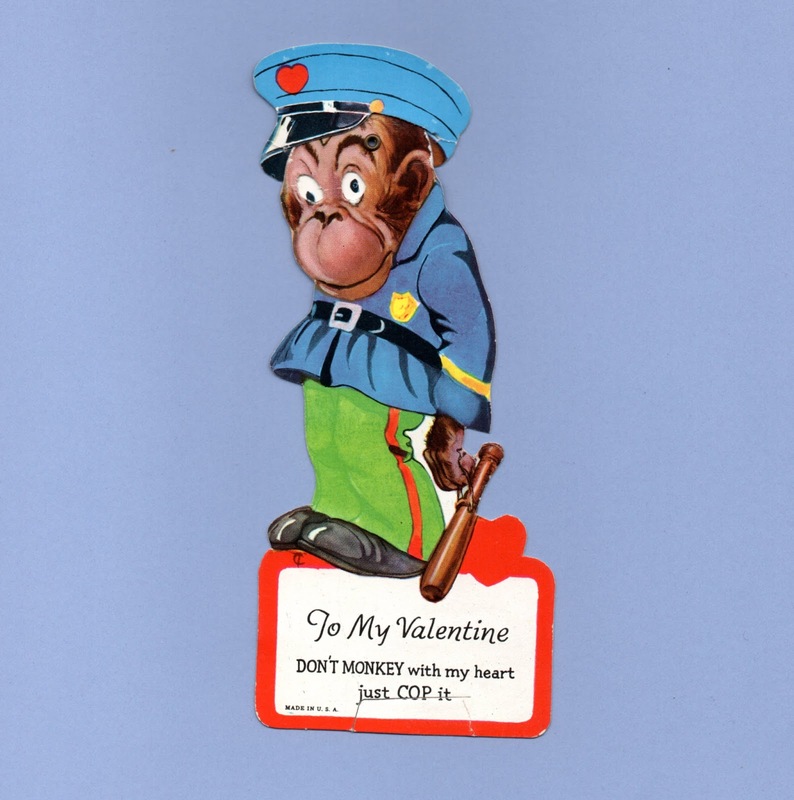 Parking isn't lawful ~ but Sparking isn't barred Be my Valentine. US 2 Only. It would sure be fun to COAST along with you My Valentine. 8 3/4" x 4 1/2"
7 1/8" x 3 5/8"